While the pot boils two dozen eggs, I filled several vases with water. Now's the fun part of having company: making things pretty in quick, satisfying ways. I don't want to cut the late blooming daffodils, but there are a few more lilac blooms on the side of the house. I like to put a bud vase in each bathroom and something green or flowering in each bedroom. Collect a variety of containers, and you'll find some that look beautiful with only a few stems. 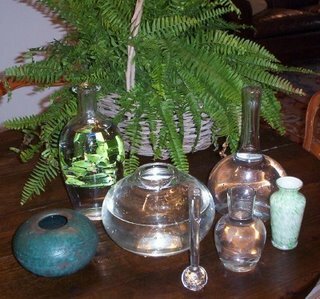 For instance, these three handblown jars will hold a handful of long fern fronds.